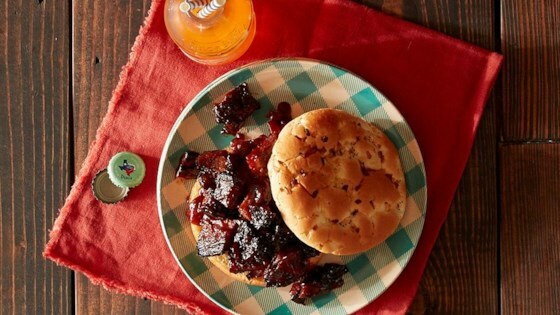 "Get your grill and palate ready to taste the ultimate in BBQ with this Kansas City Burnt End Sandwich recipe." Form two 2-foot pieces of Reynolds(R) Heavy Duty Aluminum Foil into large bowl-like shapes with 2-inch high sides; place on the grill. Add the point pieces from the brisket to the foil bowl along with the beef broth and BBQ sauce and mix until combined. Cook the point pieces for 30 minutes on medium heat with the grill door closed or until they appear to be caramelizing and deeply browned, almost as if they were burnt. Line your grill with Reynolds Wrap® Heavy Duty Aluminum Foil for easy food release and easy grill cleanup.